Hatcha and N-Type’s Sin City label recently unleashed Cato’s ‘Spotlight’, one of their biggest dance floor tracks of recent months. Featuring the vocals of Lucy Randell, ‘Spotlight’ kicks off with a drawn out electric guitar line, as Lucy’s vocal eases you into what is a heinous drop of skanking beats with an unashamed rolling riff and her full-blown vocal. Flip over to ‘Who’s Cato’, a vocal-free version of the title track and then ‘Frenzy’, a massive slice of party-pumping beats and bass that messes with your head. 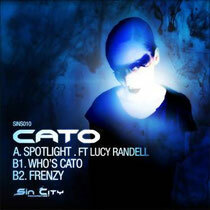 There’s also a free track giveaway of ‘Who’s Cato’ (VIP mix), included on both digital and physical packages. Out now, check the video out below.